Bancroft Wines is proud to announce their appointment as exclusive agents in the UK for iconic Piedmont producer Franco Conterno. in Monforte d’Alba (Bussia), Castiglione Falletto (Pugnane) and Novello (Panerole). The remaining 10 hectares are planted in Madonna di Como. 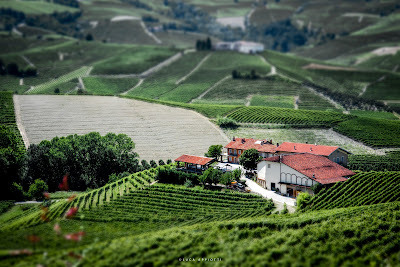 The estate’s oldest vines were planted by Pietro Conterno before being passed on to his son Giacomo and later to his nephew Franco, who took over in 1996. Today the winery run by Franco, his wife Vilma and their two sons Andrea and Daniele, together with his wife Emina. The family continues to honour the legacy of Pietro by producing authentic, world-class wines that reflect the exceptional area microclimate and terroir. Franco Conterno is dedicated to the cultivation of Lampia and Michet Nebbiolo, Barbera, Dolcetto, Merlot, Freisa and Chardonnay. Their labels bear the names of the most prestigious vineyards: Bussia and Panerole. Viticulture and winemaking strikes the perfect balance between tradition and modernity. Vineyard work eschews the use of chemicals and great care is taken to ensure the healthiest-possible grapes; each hectare requires 630 hours of manual work per year. In the cellars modern technology, meticulous analysis and judicious ageing in oak and bottle ensures the consistent high quality the estate is known for. London-based wine distributor Bancroft Wines has confirmed the appointment of Barney Davis as its new Buying Director. Davis joins the business on 4th June 2018. Davis has over 20 years of industry experience having held buying positions at Somerfield Supermarkets and The Co-Operative Group before working in commercial roles for the Company of Wine People, Robert Oatley Vineyards and Kingsland Drinks. Most recently Davis has been working at Lanchester Wines where he was responsible for restructuring the group’s bulk buying programme. Davis will join the company board and will be overseeing all aspects of the buying and shipping. Of his appointment, Davis said he was “thrilled and excited” to be joining the company at “such a pivotal time for the business”. On behalf of the entire Bancroft team, we would like to take this opportunity to congratulate Davis on his appointment and welcome him to the team.